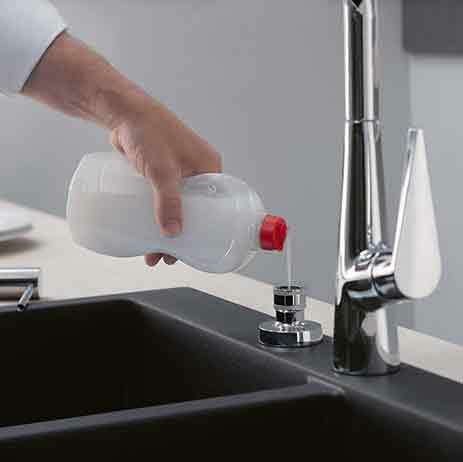 For customers who already own a hansgrohe sink or sink combi unit (with tap), here come two beautiful and practical additions: the hansgrohe lotion/soap dispenser and the hansgrohe cutting board. Cooking, prepping and cleaning is easier than ever with clever and beautifully designed kitchen accessories. Lotion/soap dispensers and cutting boards make your customers’ daily lives look, feel and function better. Customers have the choice of two finishes. 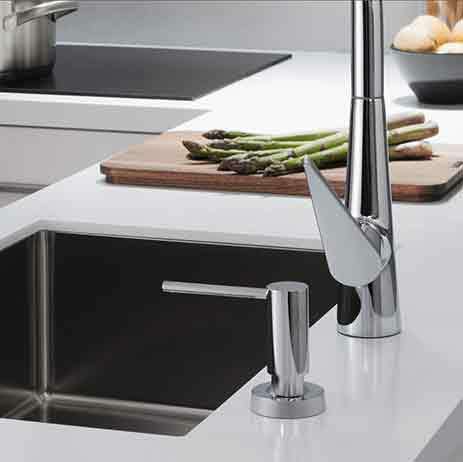 The dispenser ensures that everything around the sink unit matches visually, that the area looks beautifully tidy and that all kitchen work is made easy. 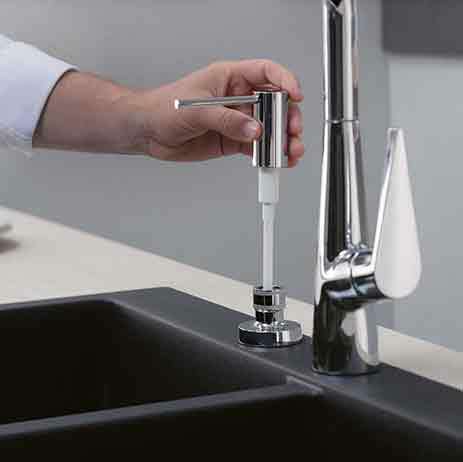 Kitchen taps and dispensers are perfectly matched in design and function: hansgrohe has designed the matching flange shape for every tap range. 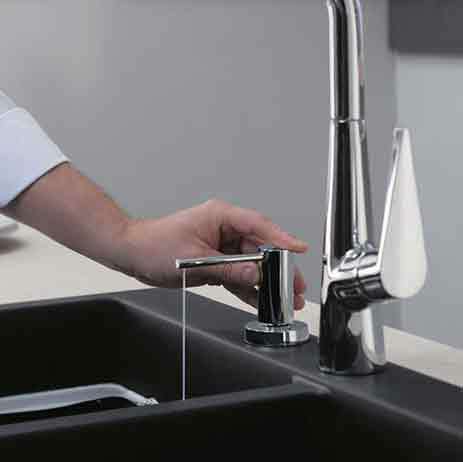 Depending on the surface finish of the tap, customers can choose between the classic chrome-plated or stainless steel finish. When installing the lotion/soap dispenser, the plumber simply drills a hole to the left or right of the kitchen tap or on the outer rim of the sink. If the dispenser is recessed, only the slimline silhouette of the pump head and wall flange are visible. The container, which holds 500 ml of liquid, remains discreetly hidden underneath and can be easily filled up from above. Shabby plastic bottles on the sink unit are a thing of the past with this dispenser. The dosage portions of 2 ml per pump stroke also make it resource-friendly. 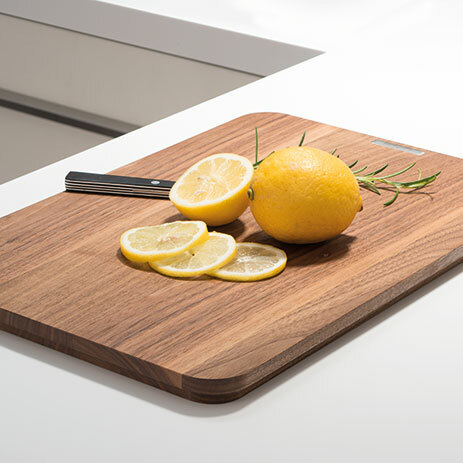 The hansgrohe cutting board is another kitchen accessory that is perfectly compatible with hansgrohe sinks. The natural product from the Black Forest innovators has brand quality. Just 20 mm high, it features a flat design, a smooth, pleasant surface and a guide edge. 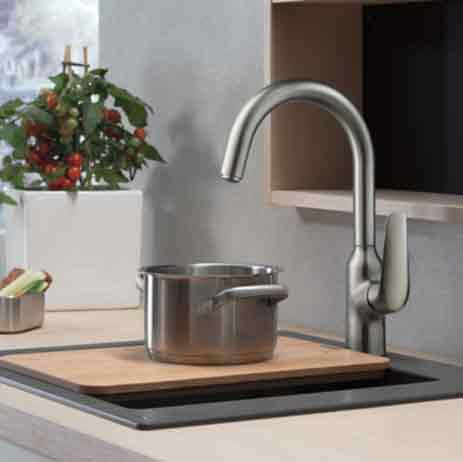 This allows it to be optimally integrated into the sink and manoeuvred on top of it. On the hansgrohe double sink, the board completely covers the smaller basin and therefore serves as an additional shelf and draining board. Each board is unique, with its own characteristic wood grain. hansgrohe offer this sustainable kitchen accessory in oak and walnut. The quality wood, which is refined with an abrasion-resistant hard oil glaze, is gentle on knives and retains its shape. Due to the high tannin content, it has an antibacterial effect. Please recommend to your customers that they clean the cutting board with hot water, some washing-up liquid and a sponge and allow it to air dry. The A71 dispenser is compatible with the M71 and Metris ranges. The A51 dispenser is compatible with the M51 and Talis ranges. The A41 dispenser is compatible with the M41 and Focus ranges and its universal design gives it a versatile edge.